Alejandro Maldonado Aguirre (born January 6, 1936) is a Guatemalan politician. 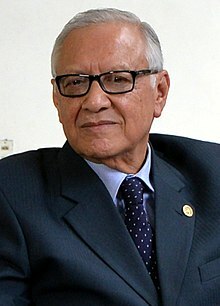 He was the acting President of Guatemala following the Congress of Guatemala's acceptance of the resignation of Otto Pérez Molina on September 3, 2015. He left office on January 14, 2016. ↑ "Guatemala ex-leader ordered to jail". 4 September 2015 – via www.bbc.com.